CHALLENGE SALOU will feature a spectacular professional field on Sunday April 07. "It´s my third year to compete in CHALLENGE SALOU and for sure this edition will be the toughest one with this awesome pro list. I am exited to compare my level with these strong guys after a long winter training and I am aiming for the first place! ", says last year´s runner up Pablo Dapena, who is highly motivated to face top athletes such as Pieter Heemeryck, winner of the inaugural CHALLENGE DAYTONA in 2018, Boris Stein from Germany and Daniel Baekkegard from Denmark. On the women´s side Daniela Bleymehl, CHALLENGE ROTH Champion of 2018, is ready to have a first hard test of the early triathlon season. "I am really looking forward to the start of the season after more than six months without racing. My preparation has been very good and especially in the last weeks of training I could gain confidence for the season. This race is going to be a good test to see where I am right now", says Bleymehl. She will face major competitors with Judith Corachan (ESP) and Margie Santimaria (ITA) who also return to Salou after their first and third place in 2018. After closing registrations on February 22, CHALLENGE SALOU underlines its international prestige with a spectacular field of triathletes from 40 countries and 78 professional triathletes who will take part in the PRO start list. The event will have a total of 1050 participants who will swim 1.9km, cycle 90km and run 21.1km in HALF and HALF RELAY distances; and swim 1,9km, cycle 60km and run 11km in the SHORT distance. With a fast 3 laps cycling and a running course along the promenade, the race will be right in the spotlight of the Costa Daurada. In addition, the race can be followed on streaming through the official social networks. What makes the race even more attractive is its 25,000 Euros of price money and the chance to qualify for THE CHAMPIONSHIP to be held in Samorin, Slovakia, this June 2. 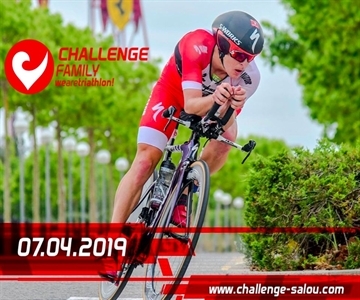 Beyond the HALF distance triathlon, CHALLENGE SALOU presents The Festival, an offer of activities so that families can also live a unique experience and enjoy this wonderful sport that merges family and sport. Starting of on Friday April 5 afternoon a "Meet & Greet" will be held with the best professional athletes of CHALLENGESALOU. On Saturday, April 6, in the morning it will be the turn for the swim test "Open Water", the 4km family friendly "Breakfast Run" and the "Junior Challenge", the foot race of the youngest. Later on Saturday, the "Pasta Party" and the "Challenge Women" will complete the offer of activities before the big race is coming up on Sunday. CHALLENGE SALOU is the main international triathlon event of the Costa Daurada area, in Catalonia, Spain, with more than 1,500 participants and 7 different races. From the 5th to the 7th of April 2019, CHALLENGE SALOU offers the opportunity to swim on a beach with shallow waters and views that reach the Delta de l'Ebre and Serra de la Mussara, to get an amazing average speed on the cycling course and to enjoy the run along the charming Costa Daurada and the fantastic warmth of its audience. In addition to the Half, Half Relay and Short races, different activities turn the weekend in Salou into a real party for the whole family. Based in Amberg, Germany, CHALLENGE FAMILY is the leading global triathlon festival race series. With over 40 races annually across 26 host countries, CHALLENGE FAMILY is the fastest growing mass endurance triathlon brand in the world. CHALLENGE FAMILY offers “events for everyone” with a “festival character,” so that everyone can share in the triathlon experience, from professionals to age-groupers.